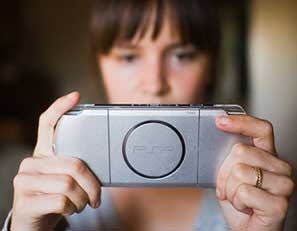 There've been a lot of sales on PSP-3000's the last few weeks in Canada & the U.S.... I came *this close* to buying a PSP-3000 a couple weeks back when Future Shop had the core PSP-3000 on for $149.99. That's only $20.00 off though... and I resisted the temptation & held out until my Television de Portable P2 came in. Glad I did. Right now Roger Video Rogers Plus has all the PSP bundles, the Star Wars/God of War/Madden/etc. PSP-2000 bundles, *and* the Ratchet & Clank PSP-3000 bundle on sale for $129.99. That seems like a really good deal considering they're bundles, not just core PSPs. I have to admit, I'm very tempted to get the R&C black PSP-3000 bundle. I already have Ratchet & Clank, but at that price it's worth it for the PSP alone. But... the same arguments against getting the PSP-3000 still apply for me. I already have 3 PSPs (1 PSP-1001, 2 Star Wars PSP-2001s)... I simply don't need a FOURTH PSP. I should get rid of 1 of my PSP-2000's as it is. And with the Television de Portable, I can finally play games on my non-HD tv using my PSP-2000, but it's probably a bit nicer through the PSP-3000..... still, is that really worth it? Unlike others with their pie-in-the-sky wishlist thinking that PSP Go! will have touchscreen, slideout, camera, kitchen sink, etc. features added on... I don't think it will have any of that, except built-in memory. And maybe a camera... but I suspect PSP Go! will basically be the "PSP-4000", just a minor upgrade by Sony, for the year 2009. The main point of PSP Go! seems to be download-only game/media content. I would be VERY surprised if Sony offered a way to transfer UMD games we already own to the PSP Go! without having to re-buy them off the PS Store. Rather, Sony probably sees it as a product for those who don't already own a PSP & only want to buy stuff off the PS Store. Wii Motion Plus - new era for Wii? Die Videogame Industry, Die! Part 5 - "Tradition"
New Star Wars Battlefront titles???? Games going back UP in price??? PSP battery - why so damn tight??? ?